← Day 66: Street Food Block Party. Day 67: Glass Blowing Workshop. This is not a blow dart gun. I have always been fascinated by glass, most likely because it is shiny and can reflect a beautiful array of colours. 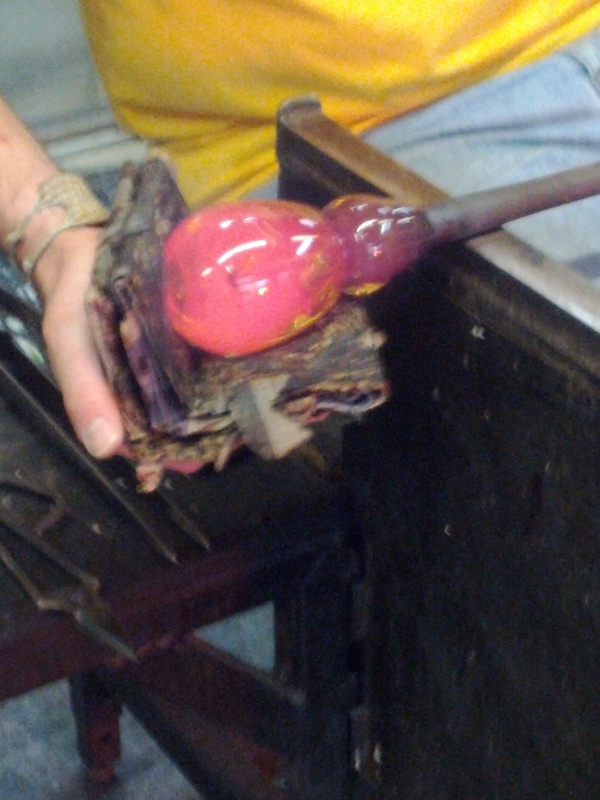 The first time I saw glass blowing, though, it truly blew my mind! How can something so hard to the touch be completely malleable like icing when it is heated up? Incredible! Similar to candle-making, I found myself drawn once again to a craft that has remained virtually unchanged for centuries. So when I stumbled upon a weekend workshop for glass blowing at the Harbourfront Centre, I became downright giddy. This was something that I had always wanted to try. I was lucky enough to secure one of only four spots available, as the process does come with a certain amount of danger requiring virtually constant supervision. Call it a bonus. The course began on Friday evening. 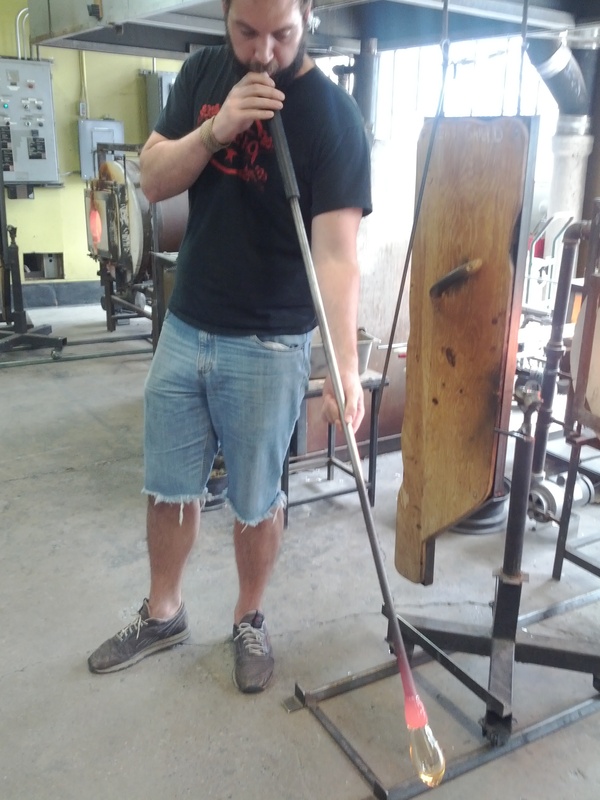 Clayton Haigh, one of the glass studio’s artists-in-residence, was our instructor. He went over the basic process and terminology with us, as well as the all-important safety reminders, in his very laid-back and casual style. 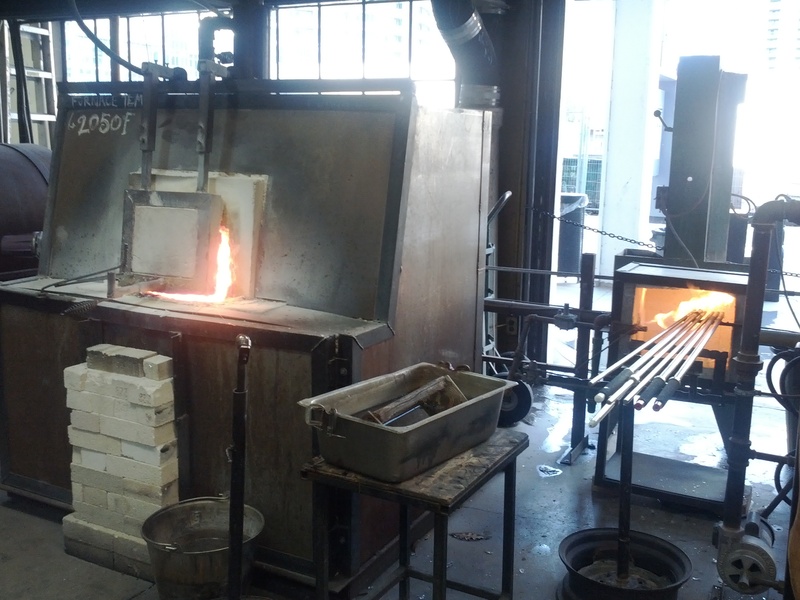 When you are working with molten glass and furnaces that are heated to 2050F, keeping your cool is definitely a good philosophy to practice. Our very own moon rocks beat paper, every time. 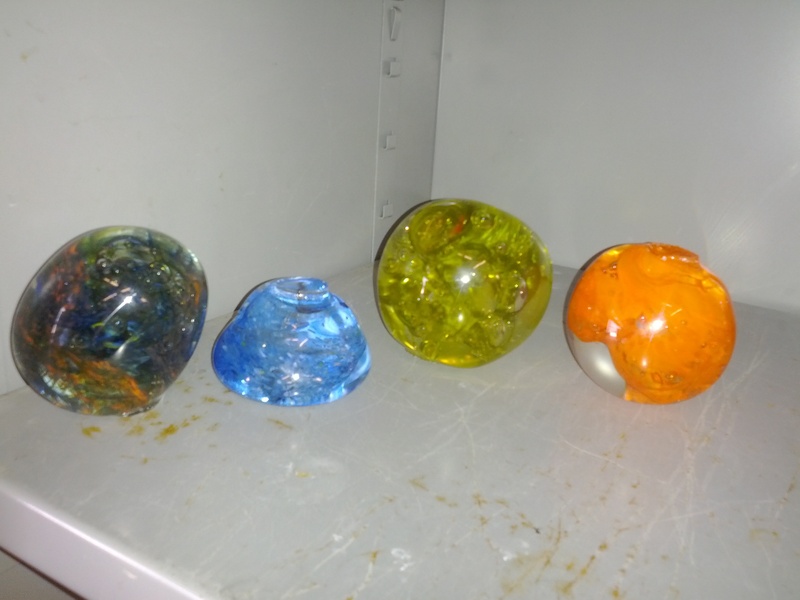 Next, he mesmerized us with a demo that ultimately resulted in an intricate and colourful paperweight. It was enchanting. We then worked in pairs to try and replicate the feat with varying degrees of success. I’ll let you guess which one of the rocks was mine. 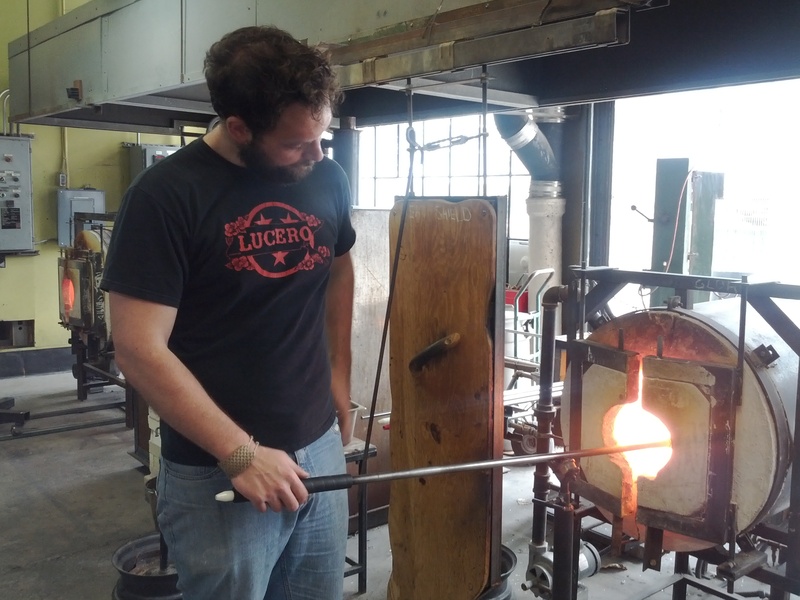 The basic process of glass blowing entails heating up the end of a hollow rod that resembles a pool cue. This is used to gather molten glass from the large brick-lined furnace, which takes about a week to shut down and cool off, so it is left on most of the year. The stick is spun constantly between the blower’s fingers to try and keep the glass centred and balanced. It is routinely fired in the glory hole (I kid you not, that is what these blazing hot ovens are called) to maintain its temperature and soft texture so that it does not cool too quickly and crack. The glass is smoothed to an elongated shape on the pole using a combination of a soaking wet wooden block, wet folded newspaper, and a stainless steel marber table. Other medieval looking tools and wooden paddles are also incorporated into the process at various points along the way. Smoothing a very hot potato. 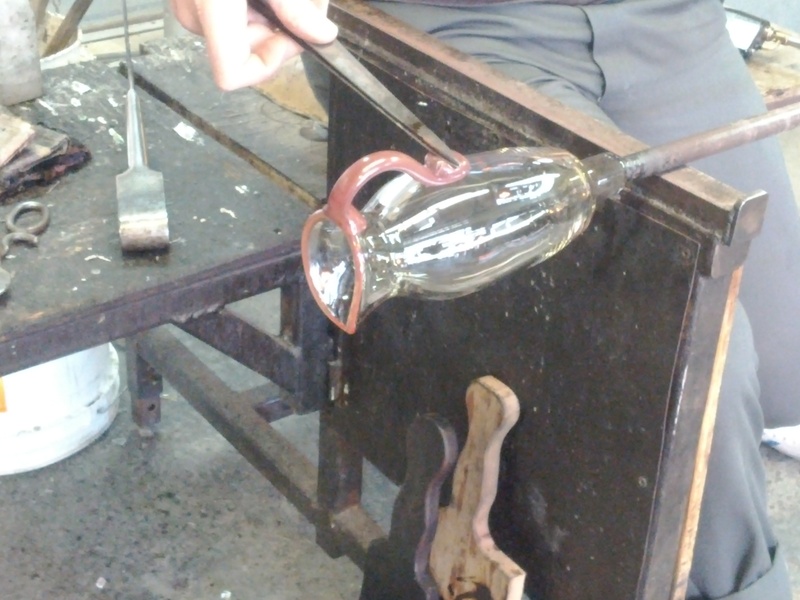 The all important blowing is done to expand the glass with an air bubble once the desired shape has been reached. A smooth and even stubby is then cooled slightly to be used as the base for another gather of molten glass. 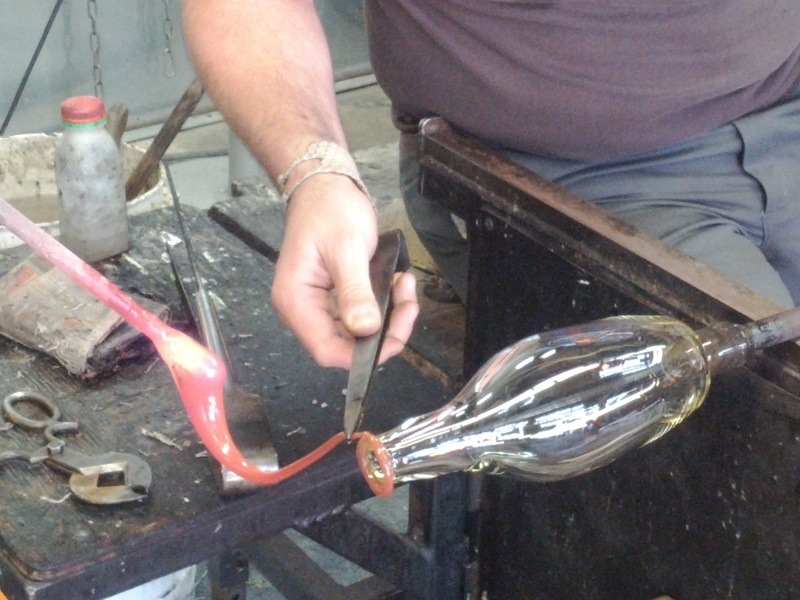 The smoothing, blowing and gathering steps, interspersed with constant firing in the glory hole, are repeated until sufficient glass is on the constantly rotating rod to make the final product. The air bubble in the glass is periodically reinforced by tapering the end of the glass into a rounded diamond-shaped tip. Once the desired size and form are more or less reached, the glass is then transferred to a solid punt stick, and, of course, constantly fired in the glory hole. 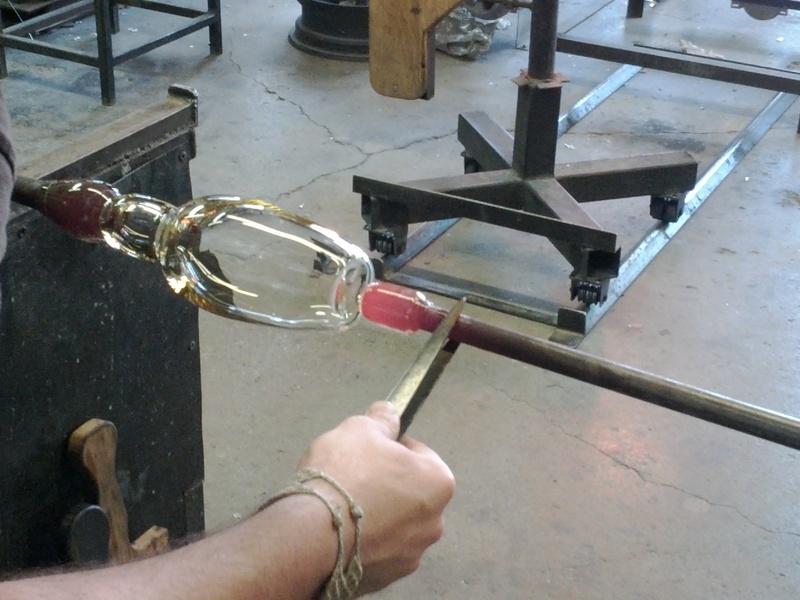 If colour is to be added to the piece, it can either be dipped in bits of coloured sand, or else a separate punt stick with a relatively small gather of glass is prepared and rolled in the sand, fired, and then dripped and dragged onto the main object with tweezers and other tools to reach the desired effect. Glass blowing requires an incredible amount of concentration and patience. Watching Clayton work inspires a great deal of respect for the craft, and it is clear to see that every single project for him is truly a labour of love. Getting to the punt of the transfer. Needless to say, the process and heat involved in working in such close proximity to the furnaces was exhausting and about as dehydrating as hot yoga. I was encouraged to find that the cut-out socks covering my arms and bottom half of my hands helped the furnaces to seem much less intimidating on the second day, and the cracking of exploding glass from the used sticks in the buckets no longer had me jumping out of my skin by late afternoon. I’m not a little teapot, despite my handle and spout. Saturday’s lesson consisted of making hollow creations, which emphasized the importance of blowing the air bubble uniformly. This resulted in creating a drinking glass for me. Sunday generated a small pitcher with a blue heart on it, followed by a clear plate, which was super fun to twirl. Between our inexperience and doubt in this rather fluid process, not to mention the occasional yet predictable catastrophe (if I never gather again, it will be too soon), we kept Clayton hopping busy. Sunday’s masterpieces chillaxing in the oven. We’re not quite done, though, as the pieces require a considerable amount of time to cool down, which is done very gradually in computer-controlled ovens. We still need to return for one more evening to grind and polish them before our masterpieces will truly reveal themselves. I am frankly astonished that I managed to emerge from the weekend miraculously unscathed, although I cannot say the same for my dear partner, who suffered a few burns on her fingers and arm. Hopefully, she will have significantly healed by the time we reunite to marvel at each other’s finished works of art later on this week. All in all, I have to say that glass blowing easily exceeded my expectations, being both more difficult and thus more rewarding than I thought. P.S. Clayton from here on in shall simply be known as The Fixer. Feel free to stop by and call him that in the open air studio at Harbourfront, where visitors are always encouraged. This entry was posted in Educational and tagged Balance Glass works, Clayton Haigh, Educational, glass blowing workshop, Harbourfront Centre, May, Toronto. Bookmark the permalink. 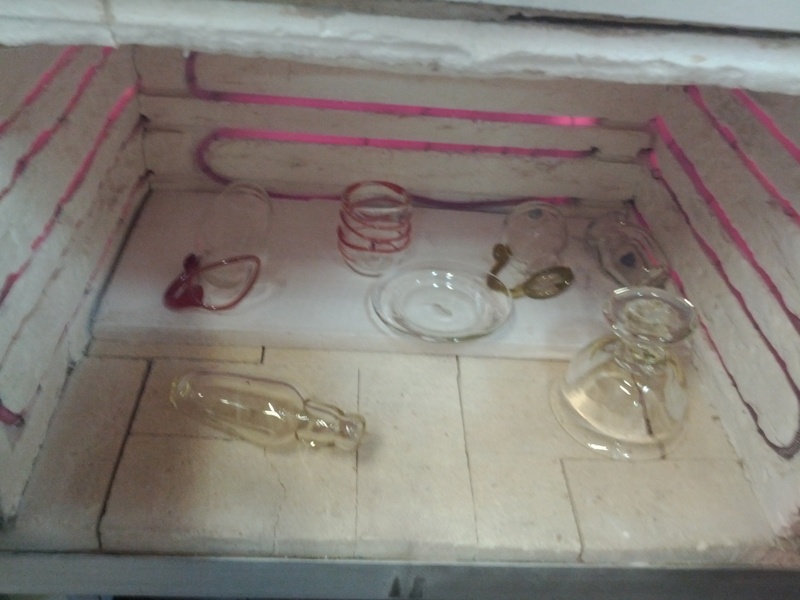 1 Response to Day 67: Glass Blowing Workshop.